I recently found some nice 14-segment displays on eBay. They use a HT16K33 driver chip; I2C interface. Here is a spin program complete with a font and a couple of photographs. I'm not sure why I keep looking at 14- or 16-segment LEDs. Matrix displays are easy to work with and support much nicer fonts. Because they were last seen being installed into a space craft that flew us to the moon? Adafruit makes a 4x14 "backpack" module that some of my customers use in Escape Room props because they do in fact have an old-school-high-tech feel. I wrote a general-purpose object for it that duplicates the features of FDS. And would that also be used for the displays inside Doc Brown's Time Traveling Delorean as well? I'm bringing that up because the displays as I recall resembled the ones that Tom there obtained. That's interesting. It looks like only the month is displayed using 14-segments. The day, year and time appear to use 7-segment displays. From the Wikipedia article, I would guess that they are 14-segment. Looks more like the 14-segment display. The T in OCT is not consistent with the 9-segment display. Maybe they used a mix of different segment displays, or possibly they made a mask for the months that looked like a multi-segment display. Good point. Does anybody know what all months (i.e. alpha letters) they used? If this forum were Big Bang Theory, we would be watching the entire series by now. Here's a screenshot showing DEC. Looks custom made to me. Yes, custom as in 'custom done in the graphics department' ? If not Photoshop, then a printed mask that drops over a backlight, somewhat font mapped. Some of those characters are mutually exclusive on a real segment display. Anybody notice the years in the original image were a bit whacko? It looks like th-. 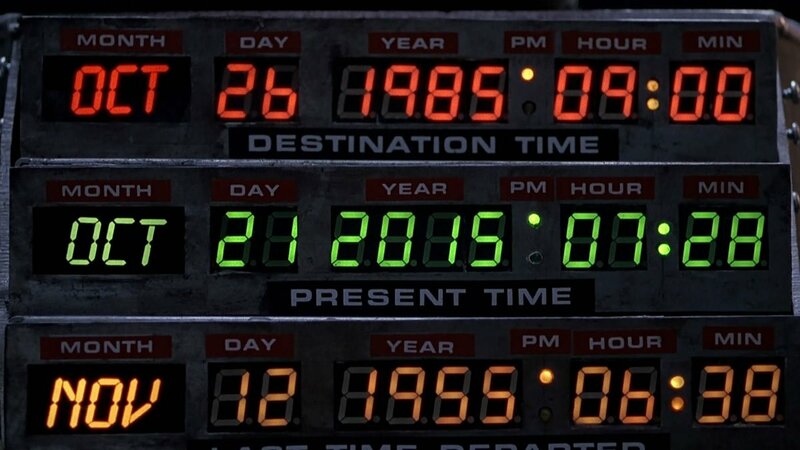 Hold up, is this by any chance the time panel on the Delorean from Back to the Future? Actually yes. They are not the display in a good friend's TARDIS.